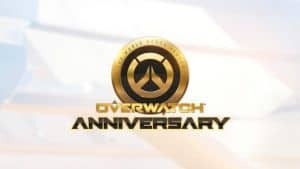 Overwatch Anniversary Event Details | Nerd Much? It’s been nearly two years since Overwatch debuted for PC. As we near the game’s second anniversary, Blizzard is gearing up a fresh event to celebrate the occasion. Over 50 new items are being added to the game with the Anniversary event. The content includes 8 Legendary items and 3 Epic skins. New dance emotes are also being added for Doomfist, Moira and Brigitte. Blizzard will also be bringing some fan favorites back to Overwatch. Prior seasonal cosmetic items such as last year’s dance emotes are returning. Past seasonal brawls will be hitting the Arcade once again too and rotated daily. We’ll be getting a new Deathmatch map that Blizzard has named Petra. Deathmatch will also be getting a new competitive mode which will implement placement matches, skill rating tiers and leaderboards. Anyone that boots up Overwatch during the Anniversary event will earn themselves a free Legendary Anniversary Loot Box, guaranteeing the player a Legendary item. And players that decide to purchase the 50 Loot Box Bundle will have a Legendary Anniversary Loot Box thrown in as a bonus too. Said Boxes will hold previous seasonal event loot so you can get a second chance at all the goodies you may have missed over the last couple of years. Blizzard is also marking the occasion with a free weekend of play for those that don’t own the game. Players can download and try the hero shooter from May 25th through May 29th. The developer states that a PlayStation Plus account will not be required to play on Sony’s platform. A new Legendary Edition of the game is being released digitally too. The new edition will feature sets of Legendary, Epic and Origin skins, amounting to 15 skins in total, thrown in with purchase. The Overwatch Anniversary will run from May 22nd through June 12th. Go blow out the candles and jump in to celebrate.